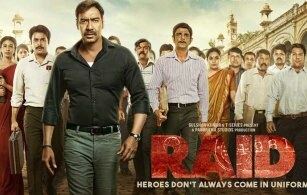 The plot revolves around the no-nonsense, honest-to-the-core Income Tax officer, Amay Patnaik (Ajay Devgn), and his quest to raid all the top notch businessmen, henchmen and politicians of the country defaulting on the Income Tax. Rameshwar Singh AKA Tauji (Saurabh Shukla), a typical greasy politician is his nemesis. Together, they begin a cat and mouse chase kind of game which results in amazing twists and turns as the film progresses, keeping masses at the edge of their seats, waiting for more. Amay’s target is to recover a whooping amount of Rs. 420 crores which Tauji has hidden away in his ‘white house’. As the film progresses, Tauji mounts pressure on Amay to withdraw the raid but despite all this, he carries out the procedure. Does Amay succeed in his mission? Well we wouldn’t like to give that away.